The death toll from heavy rain and flooding-related incidents in Chennai has increased to 14, with five deaths occurring between Thursday night and Friday morning. Yet again, torrential downpour has brought the capital city of Tamil Nadu on its knees. 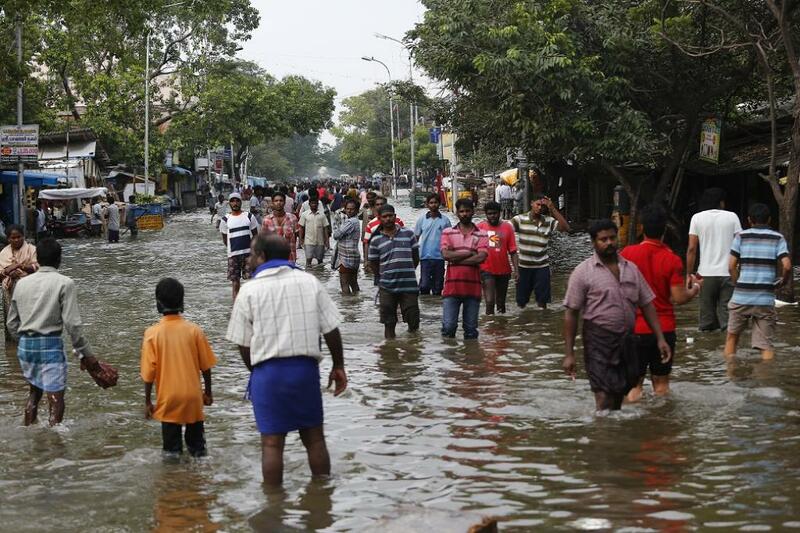 Several coastal pockets of Chennai experienced severe waterlogging with people seen trudging through floodwaters and some remaining stranded on the roads for hours. The rainfall on Thursday (November 2), is reportedly the third highest in Chennai’s history in a single day for November, only behind 452.2 mm in 1976 and 246.15 mm in 2015. On that day, Nungambakkam Observatory in Chennai recorded 183 mm of rain. On November 3, the city received 202.6 mm of rain as opposed to 12.9 mm, which is the normal around this time. In just eight days since the onset of northeast monsoon on October 27, the city recorded 554.2 mm of rainfall—which is 74 per cent of the long-term average of 750 mm it receives between October 1 and December 15. As a preventive measure, power connection has been stopped by the authorities in 70 low-lying localities across the city. The government has also kept 115 multi-purpose shelters ready in the coastal districts. Due to the low pressure area formed over Sri Lanka and southwest Bay of Bengal and its associated cyclonic circulation, isolated heavy rainfall is expected over Tamil Nadu till November 4, the India Meteorological Department (IMD) had predicted. The incidents of severe waterlogging revived the memory of 2015 when Chennai witnessed its worst floods in over a century with over 150 people losing lives. The city is likely to receive 300-500 mm more rain in the next few days, according to BBC weather. For the week ending November 1, districts such as Kancheepuram (166.6 mm), Cuddalore (164.4 mm), Chennai (208.6 mm), Nagapattinam (257 mm) and Karaikal (278.3 mm) received an excess rainfall, between 150 and 250 per cent higher than the normal range. Meanwhile, the rain in and around Chennai has increased storage levels of four reservoirs— Poondi, Cholavaram, Red Hills and Chembarambakkam—supplying drinking water to the city. The famous Marina beach front and service lanes were under water and the coastal district of Nagapattinam witnessed submerging houses and rains affecting standing crops over thousands of hectares. This Vedic astrology writer had divided the year 2017 into three parts from the angle of , more or less , similarity of planetary impact in relation to India ------January to March , April to July and August to December. In between third part of the year , coastal States of India , namely , Tamil Nadu , Andhra Pradesh , Telengana were sought to be alerted for more care and appropriate strategy against dangerous storm like rains and floods. It may be said that coastal areas usually has rains during these months. Yes , but there is a difference between rains and marked storm like rains. So the coastal States aforesaid may take better precautions while there is no need to be panicky. These alerts for more care and appropriate strategy in between August to December 2017 against rains and floods in Tamil Nadu and some other coastal States were issued widely to Indian news media last year in October and November 2016.